In the old days the beasts, birds, fishes, insects, and plants could all talk, and they and the people lived together in peace and friendship. But as time went on the people increased so rapidly that their settlements spread over the whole earth, and the poor animals found themselves beginning to be cramped for room. This was bad enough, but to make it worse Man invented bows, knives, blowguns, spears, and hooks, and began to slaughter the larger animals, birds, and fishes for their flesh or their skins, while the smaller creatures, such as the frogs and worms, were crushed and trodden upon without thought, out of pure carelessness or contempt. So the animals resolved to consult upon measures for their common safety. The Bears were the first to meet in council in their townhouse under Kuwâ'hï mountain, the "Mulberry place," and the old White Bear chief presided. After each in turn had complained of the way in which Man killed their friends, ate their flesh, and used their skins for his own purposes, it was decided to begin war at once against him. Some one asked what weapons Man used to destroy them. "Bows and arrows, of course, cried all the Bears in chorus. "And what are they made of?" was the next question. "The bow of wood, and the string of our entrails," replied one of the Bears. It was then proposed that they make a bow and some arrows and see if they, could not use the same weapons against Man himself. So one Bear got a nice piece of locust wood and another sacrificed himself for the good of the rest in order to furnish a piece of his entrails for the string. But when everything was ready and the first Bear stepped up to make the trial, it was found that in letting the arrow fly after drawing back the bow, his long claws caught the string and spoiled the shot. This was annoying, but some one suggested that they might trim his claws, which was accordingly done, and on a second trial it was found that the arrow went straight to the mark. But here the chief, the old White Bear, objected, saying it was necessary that they should have long claws in order to be able to climb trees. "One of us has already died to furnish the bowstring, and if we now cut off our claws we must all starve together. It is better to trust to the teeth and claws that nature gave us, for it is plain that man's weapons were not intended for us." The Deer next held a council under their chief, the Little Deer, and after some talk decided to send rheumatism to every hunter who should kill one of them unless he took care to ask their pardon for the offense. 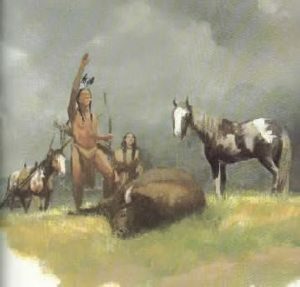 They sent notice of their decision to the nearest settlement of Indians and told them at the same time what to do when necessity forced them to kill one of the Deer tribe. Now, whenever the hunter shoots a Deer, the Little Deer, who is swift as the wind and can not be wounded, runs quickly up to the spot and, bending over the blood-stains, asks the spirit of the Deer if it has heard the prayer of the hunter for pardon. If the reply be "Yes," all is well, and the Little Deer goes on his way; but if the reply be "No," he follows on the trail of the hunter, guided by the drops of blood on the ground, until he arrives at his cabin in the settlement, when the Little Deer enters invisibly and strikes the hunter with rheumatism, so that he becomes at once a helpless cripple. No hunter who has regard for his health ever fails to ask pardon of the Deer for killing it, although some hunters who have not learned the prayer may try to turn aside the Little Deer from his pursuit by building a fire behind them in the trail. Next came the Fishes and Reptiles, who had their own complaints against Man. They held their council together and determined to make their victims dream of snakes twining about them in slimy folds and blowing foul breath in their faces, or to make them dream of eating raw or decaying fish, so that they would lose appetite, sicken, and die. This is why people dream about snakes and fish. Finally the Birds, Insects, and smaller animals came together for the same purpose, and the Grubworm was chief of the council. It was decided that each in turn should give an opinion, and then they would vote on the question as to whether or not Man was guilty. Seven votes should be enough to condemn him. One after another denounced Man's cruelty and injustice toward the other animals and voted in favor of his death. The Frog spoke first, saying: "We must do something to check the increase of the race, or people will become so numerous that we shall be crowded from off the earth. See how they have kicked me about because I'm ugly, as they say, until my back is covered with sores;" and here he showed the spots on his skin. Next came the Bird--no one remembers now which one it was--who condemned Man "because he burns my feet off," meaning the way in which the hunter barbecues birds by impaling them on a stick set over the fire, so that their feathers and tender feet are singed off. Others followed in the same strain. The Ground-squirrel alone ventured to say a good word for Man, who seldom hurt him because he was so small, but this made the others so angry that they fell upon the Ground-squirrel and tore him with their claws, and the stripes are on his back to this day. They began then to devise and name so many new diseases, one after another, that had not their invention at last failed them, no one of the human race would have been able to survive. The grubworm grew constantly more pleased as the name of each disease was called off, until at last they reached the end of the list, when some one proposed to make menstruation sometimes fatal to women. On this he rose-up in his place and cried: "Wadâñ'! [Thanks!] I'm glad some more of them will die, for they are getting so thick that they tread on me." The thought fairly made him shake with joy, so that he fell over backward and could not get on his feet again, but had to wriggle off on his back, as the Grubworm has done ever since. When the Plants, who were friendly to Man, heard what had been done by the animals, they determined to defeat the latter's evil designs. Each Tree, Shrub, and Herb, down even to the Grasses and Mosses, agreed to furnish a cure for some one of the diseases named, and each said: "I shall appear to help Man when he calls upon me in his need." Thus came medicine; and the plants, every one of which has its use if we only knew it, furnish the remedy to counteract the evil wrought by the revengeful animals. Even weeds were made for some good purpose, which we must find out for ourselves. When the doctor does not know what medicine to use for a sick man the spirit of the plant tells him. If there were No Plants,we wouldn't be here. We breathe in what they breathe out. That is how we learn from them.